October 13, 2018, a group of 160 migrant in San Pedro Sula, Honduras met at a bus terminal with the intent to flee their country plagued by violence and corruption. They wouldn’t be the only ones to make this journey. A former politician had spread their plan on Facebook and by the next day they caravan had grown to 1,000, all trying to escape poverty, violence and persecution. 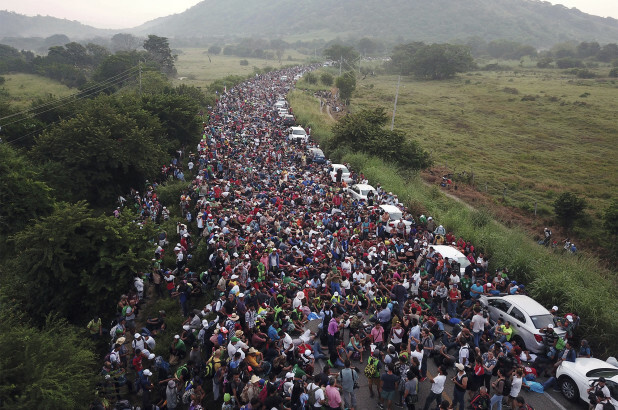 This caravan, now over 5,000 strong people are fleeing their home countries of Honduras, Guatemala, and El Salvador, is making its way up North towards the United States, seeking asylum in the land of new opportunities. These caravans have happened in the past, but this one stands out by the absolute number of people who have joined in as well as the president’s obsession with it. The caravan has stayed in the news for so long because of the president’s handling of the situation. Along with criticizing many of the Central American countries for allowing the migrants to leave the region and jeopardizing our valuable trade with many of them, he has also threatened to stop sending foreign aid. The president has also responded by sending active duty military troop down to the Mexican border. The Pentagon announced on October 29 that 5,000 troops would be arriving at the border, 800 of which arrived on November 3. Despite the Pentagon determining that the caravan did not pose a threat to the United States, Trump has stated that he is still willing to send up to 15,000 to curve this migrant invasion, a troop presence that would be on par with the US presence in Afghanistan. At no time has any representative of the caravan indicted that they will use violence to enter the US. Instead, as in previous instances they seek the available legal means of asylum. Should the caravan arrive, the United States has a legal obligation to listen to these asylum claims. Although, the caravan is trying to enter the country legally, should they be caught in the country illegal, the person is entitled to have their claim be heard by the government. In order to be considered an asylum seeker, they must be running from fear of violence from their home country and/or in serious fear of persecution if they remain. Despite their politicization for the purpose of stoking pre-election day fear, these people, yes they are people, seek only freedom.